Hong Kong's Samena Capital and Swiss boutique private bank and money manager Reyl & Cie SA plan to raise up to $250 million in a seed fund that will invest in hedge funds focusing on Asia, the Middle East and North Africa. The two firms had committed $25 million to start Samena Angel Fund II, said Samena Capital founder and President Shirish Saraf, adding that Reyl would tap private bank clients to help expand the fund they expect to launch by October. The firms announced a joint venture combining Samena Asia Managers, Samena Capital's hedge fund seeding business, with Reyl & Cie on Tuesday. “That's the business we see going forward as a real synergy with REYL,” Saraf told Reuters in an interview. Reyl has bought a 50 percent stake in Samena Asia Managers. “We have a better story together for how we grow the funds,” the London School of Economics alumnus said. Geneva-based Reyl Group manages $4.5 billion with offices in Paris, Luxembourg and Singapore. Samena Asia Managers runs a $98 million seed fund — Samena Angel Fund I — which has invested in Chicago-based Asia-focused multi-strategy hedge fund Phalanx and Greater China long/short hedge fund Snow Lake. The fund gave a 23.12 percent return since its launch in January 2007 to end of March 2011. By comparison, the MSCI AC Asia Pacific index was down 6.3 percent during the period. Samena Angel Fund II would broaden the scope of the seed fund, said Julius Wang, a managing director at Samena Capital, adding that the fund may expand to managed accounts and create portfolios that might interest clients form Europe. “We will reach out to a broader audience for Fund II,” Wang said. In May 2009, Samena Capital bought Vision Asia Pacific Ltd co-founded by Wang to create a hedge fund seeding platform. Samena Capital focuses on Asia, the Middle East and North Africa and manages more than $400 million in private equity assets with a research presence in India and Bahrain, the firm is in the process of launching its second special situations fund with a targeted amount of $700 million. Two of the world's most successful investors have gone head to head over the price of gold, with the man who broke the Bank of England baling out of the precious metal and the man who made a fortune by betting against the American housing market talking it up. At the end of a week when plunging commodity prices fuelled speculation that the boom might be over, it emerged that George Soros– who made $1.1bn from betting against the pound in 1992 – has sold much of the gold and silver holdings he has built up in the past three years, realising an estimated return of 65% on his investment. By contrast, meanwhile, John Paulson, who made his hedge fund more than $20bn from betting against the US housing market by “shorting” sub-prime mortgages, this week told investors that he still has most of his personal money invested in gold. The billionaires' differing stances emerged as the gold price fell by a further 1.6% and silver rounded off its worst week in at least 35 years, dropping another 9.6% to take its losses over the week to a startling 29%. Paulson takes quite a different view on price, telling investors that gold could increase from its present, near-record, level of about $1,487 an ounce to as much as $4,000 over the next three to five years. He believes the gold price will keep rising – after increasing by nearly half in the past three years – in large part, he says, by providing an effective store of value against rising inflation. That two such successful investors should take such wildly differing views on the price of gold underlines how much uncertainty surrounds the prices of precious metals and other commodities, at least in the short term. Like many other commodities, the price of gold has surged in recent months as high inflation and low interest rates prompt speculators to move away from US treasuries and other low-yielding assets in search of higher returns. In addition to the negative real interest rate, investors have been piling into commodities such as gold and silver because the struggling US dollar – in which many of them are priced – has made them cheaper and increased their attractiveness as an alternative currency and investment of value. Furthermore, demand from manufacturers for the raw materials they need to make their products has been increasing, as the Chinese economy powers ahead and the European and American economies pick up. As a result, prices of commodities such as gold, silver, cocoa and coffee have hit record, or near-record, highs in recent weeks, prompting speculation that the rally may have been overdone. Traders and economists are divided about whether last week's rout marks the top of the commodities market, or represents a temporary blip before prices continue to surge. Holt believes that commodities have hit the top of the market since they have “run too far ahead of other fundamentals”. However, he also thinks that prices will start to rise again at some point in the second half of the year and, subject to the odd fluctuation, predicts that commodity prices from oil to coffee, and copper to cocoa and gold could at least double in the next 20 years or less as increasingly wealthy populations of China, India and other emerging economies demand more consumer goods. The price rises would put huge pressure on the lifestyles of people in the west, whose slower-growth economies would be less able to weather their impact than those of the fast-growing emerging nations, where breakneck growth would far outstrip rising commodity costs, he said. After diving by as much as 12% on Thursday – and by nearly another 5% this morning – oil rebounded following the release of strong employment data in the US that strengthened its economic outlook. Oil was up $0.41, at $111.21 a barrel, late this afternoon, after hitting $126 last week. Hedge funds investing in India are not making as much headlines as they did during the previous bull run in 2007-08, but they seem to be making money for investors . Good enough to be ranked among the best-performing hedge funds globally, according to analysts at Singapore’s fund research house Eurekahedge. The Eurekahedge Indian Hedge Fund Index returned over 5% in the first eight months of 2010 vis-à-vis 2% gains by benchmark Sensex in the same period. The numbers for September were not available. Asset managers attribute the decent performance of India-focused hedge funds to the buoyant stock market, ‘long only’ strategies by their managers and gains in mid-cap shares. Within Indian hedge funds, 68% of the funds employ ‘long-short’ equity strategy — a mix of buying assets as well as short-selling them — and more than 70% of the funds invest in equities, said experts. “Hedge funds are active in Indian equities,” Farhan Mumtaz, senior analyst, Eurekahedge told ET. “Funds with global and emerging market mandates have also increased their allocations to India,” he added. Longer investment time-frame has helped hedge funds log better returns this year. Funds belonging to asset managers like Q-India, Halbis, FMG, Baer Capital and Insynergy have all outperformed benchmarks and key hedge fund indices during the considered period. The case was different in 2009, when the Eurekahedge Indian Hedge Fund Index returned just 52% against 76% logged by the Sensex. According to Mr Mumtaz, most hedge funds have turned cautious and the proportion of ‘long-short’ strategy has come down from 80% in 2008-09 to 68% in 2010. Long-short strategies involve allocating a specific percentage of the corpus to buy securities that are expected to go up while short-selling those expected to decline in value. When balanced correctly, long-short strategies provide absolute returns with low correlation to the benchmark. Funds are employing broader mandates (such as multi-strategies) in their attempt to not remain dependent of price momentum of stocks. “Hedge fund managers tried complex strategies in 2008 and failed, as a result of which they been reasonably defensive in 2009 and 2010. They have now managed to get some good sectoral and stock calls,” said Alok Sama, president, Baer Capital Partners. According to him, hedge funds have managed to log higher returns by investing in liquid mid-caps. “Most of them have been long-term bets. However, buying Indian shares is a bit difficult now since most counters are trading at expensive price levels. The current market rally has been fuelled by excess liquidity,” added Mr Sama. Steady investment returns have resulted in the swelling-up of asset bases of most India-focused hedge funds over the past few months. Average asset under management of an Indian hedge fund is estimated at $65 million by fund researchers. Most of the money (for India-focused funds) is coming from hedge funds, family offices and high net worth investors. Slowly but surely, India hedge funds are beginning to offer the kind of strategies that can attract big fish such as London hedge fund giant Man Group, whose fund of hedge funds business could make its first direct allocation to an Indian hedge fund within a year, according to Asia business head Patric Gysin. The entire Indian hedge fund universe is modest at around 50-60 funds. When that universe is boiled down to reveal those funds sophisticated enough to attract larger institutions and marquee fund of hedge funds (FoHF) investment from Europe or the US, it could more appropriately be described as a small planetary system – if one was feeling generous. The $15bn FoHF portfolio of London-based hedge fund giant Man Group, for example, is 10-15% exposed to emerging markets and 1% exposed to India. None of the latter exposure is achieved through direct investment into dedicated India-based hedge funds, but rather via the firm’s global emerging markets or pan-Asia funds, which then allocate a variable portion of their pot to Indian securities. However, according the firm’s Asia business head and senior portfolio advisor Patric Gysin, this is likely to change. Indeed, encouraging signs of life at the more liquid end of the Indian hedge fund market mean Man could realistically make its first direct investment into an India hedge fund within a year, he says. Currently the firm is working closely with around ten India-based hedge funds – around half a dozen of which Gysin describes as “really serious India hedge funds with a track record and a mandate which suits our needs”, and the remainder, which are recently launched funds offering encouraging new levels of flexibility in their approach. Typically, India-based hedge funds are relatively risk-averse and illiquid equity funds, which fall somewhat short of the highly liquid, short-selling, alpha-generating strategies synonymous with the ‘hedge fund’ tag. Strategies which can help alleviate the volatility inherent in emerging markets, Gysin says. But a recent uptick in the launch of more nimble India-based hedge funds – predominantly from within Asia as opposed to the West – suggest that the hedge fund industry is becoming more aligned to the requirements of sophisticated investors like Man. According to Gysin, many of the existing 50-60 India-based hedge funds focus on small/mid-cap, Private Investment in Public Equity (Pipe) and pre-IPO investments as their staple diet. “This doesn’t fit with what we are looking for,” he says. Indeed, the theme of manager flexibility is paramount to Man’s emerging market fund selection process, and the firm broadly avoids the “small, illiquid names” investing in these kinds of transactions. According to Gysin, Man’s underlying managers have in common a flexible approach in terms of how much market risk their funds can take – some often operating as low as 10-20% net long, and sometimes even net short if necessary. If Man does eventually add an India-focused fund to its approved list, investment into the fund is most likely to be done via one of the firm’s diversified long/short emerging market or pan-Asian funds, which have remits that allow them to invest in a large number of managers, Gysin says. The firm runs a wide range of products – some of which have limitations on the number of funds they can invest in, and are more likely to invest in regional hedge funds rather than country-specific offerings, he adds. While Gysin notes that there are certain areas of the India market which he thinks need to improve in order to encourage Indian hedge fund activity – mainly revolving around ease of access and investment flexibility – equities will continue to present the best strategy for India-based hedge funds, and long/short equity investing will continue to form the basis of Man’s Indian hedge fund exposure. “India is pretty much an equity story. Hedge funds can only be as liquid as the underlying market; if the markets are drying up, so do hedge fund investors. The India equity market is fairly developed for local investors, and I would expect equities to be the most interesting way to capture upside,” Gysin says. “But to encourage the Indian hedge fund industry to grow, the regulations for shorting stocks have to improve – it’s a headache for offshore managers investing in India through Mauritius entities. Whatever the regulators can do to ease market access for hedge funds will be positive for the markets – if the market has hedge fund participation, it increases liquidity and helps pricing mechanisms,” he adds. “India is still a challenging market to get exposure to,” Gysin says, noting that while a massive institution like Man has the global resources to conduct thorough research and get close to the Indian market, smaller firms without a presence in the region will continue to find this difficult. However, despite the challenges, the Indian bourse continues to appeal, and as India’s economic story unfolds it looks increasing likely that Man will find an India-based hedge fund that ticks all the boxes. Indeed, even without allocation to a dedicated India manager, Man’s exposure to Indian securities has increased via its regional funds, Gysin says, and the firm’s long-term outlook for the market is very positive. Despite Dubai Financial Group calling off its plans to sell stake in the Bombay Stock Exchange (BSE), Toronto-based investment broker Thomas Caldwell and philanthropist George Kaiser have managed to acquire shares in Asia’s oldest bourse. Over the past few months, Kaiser has acquired over 3 per cent in BSE, while Caldwell has increased his shareholding from 3.8 per cent last year to 4.25 per cent through multiple private deals, exchange officials said. They said the shares had been purchased from brokers, as well as some of the institutional investors in BSE. Along with US hedge fund legend George Soros and private equity firm J C Flowers, Caldwell and Kaiser were in the race to buy Dubai Financial Group LLC’s four per cent stake in BSE. Kaiser, through his private equity firm, Argonaut, was the highest bidder and had offered to pay Rs 370 a share. But, looking at the rush, embattled Dubai Financial deferred its stake sale plans in anticipation of higher valuations in the future, said a deal maker. Taking a cue from Caldwell and Kaiser, Soros and J C Flowers have also initiated talks with broker-members and institutional investors to acquire some stake in BSE. According to market players, the rush for BSE stake is in anticipation of improved performance and further gains in the coming months. More players are expected to rush in following the BSE board’s approval to issue 6.5 million fresh shares. The valuation of the exchange has seen a sudden spurt in the recent past. Under the new management, BSE changed its derivative trading cycle to compete with the National Stock Exchange (NSE), launched a mutual fund trading platform and is upgrading its technology platform. The exchange has a near-28 per cent share of the equity spot market in India and has been making efforts to develop its derivative trading segment, where NSE is a monopoly player. BSE will launch currency derivatives in June and is also in the process of increasing its stake in Central Depository Services to 51 per cent. Currently, six foreign investors hold 25.65 per cent of BSE and five Indian institutions hold 12 per cent. A little under 62 per cent of the exchange’s shares are widely held. Kaiser is the majority shareholder of a largely successful Bank of Oklahoma and GBK Corporation, parent of Kaiser-Francis Oil Company (an independent oil and gas exploration and production company) and founder of Excelerate Energy. Caldwell is recognised as one of the world’s foremost investors in securities exchanges and his clients have holdings in Hong Kong, Johannesburg, London, Osaka, Toronto, the Chicago Board Options Exchange and the International Stock Exchange. Caldwell has been at the helm of affairs during every major consolidation of stock exchanges in the US. The US-based hedge fund Arcstone Capital LLC has made a passage to India by picking up close to 5% stake in the Kerala-based old generation private sector bank —Dhanlaxmi Bank. The fund has mopped up the shares in the bank through its investment vehicle Passage to India Master Fund Ltd. The Denver-based hedge fund has been scouring for value buys in India for the past couple of years. Aster Business Research Pvt Ltd is the sole advisor for the US-hedge fund in shaping its India strategy. However, investment in Dhanlaxmi Bank is the first step for Arcstone in India is not immediately known. Aster officials were not available for comment. According to information available with FE, Arcstone, through its India-specific investment fund Passage To India Master Fund Ltd has bought 30 lakh shares of Dhanlaxmi Bank on the BSE in a single off-market deal on Friday. This translates into roughly 5% stake in the Kerala-based bank. 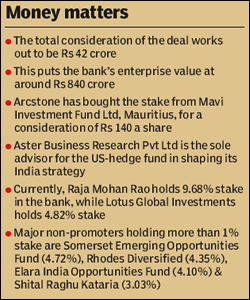 Arcstone has bought the stake from Mavi Investment Fund Ltd, Mauritius for a consideration of Rs 140 a share, coughing up a premium of Rs 7.15 per share over the closing price of the scrip on BSE at Rs 132.85 on Friday. The total consideration of the deal works out to be Rs 42 crore. This puts the bank’s enterprise value at around Rs 840 crore. It could not be immediately ascertained weather the Fund had informed the banking regulator RBI about the buy. The RBI guidelines stipulates that any investor whose holding is nearing 5% of the total voting capital of a bank should informed the apex bank about the move in advance. Dhanlaxmi Bank was in the eye of a storm when P Raja Mohan Rao and persons acting in concert (PACs) with him picked over 37% stake in the Bank in 2002. The move created a stir among the minority shareholders who cried foul over Rao group’s virtual takeover of the Bank, which was not having any foreign or domestic promoters. Subsequently, banking regulator RBI had stepped in and asked the Rao family to bring down their stake in the bank to less than 10% level. The Rao family has pared their stake in Dhanlaxmi Bank to 10% level in September 2007, following the apex bank’s order. Currently, Raja Mohan Rao holds 9.68% stake in the bank, while Lotus Global Investments holds 4.82% stake. Global business in Mauritius is active mainly in the area of investment in India, Africa and China. Mauritius is a leading provider of foreign direct investment in India due to favourable treatment under the double taxation agreement between the two countries. Since the signing of the agreement, many investment and hedge funds have been (and continue to be) incorporated in Mauritius for the specific purpose of investment in India. The benefits of including Mauritius in investment in the Indian market are unparalleled, whether by way of a collective investment scheme, a closed-end fund or other investment vehicle. Institutions, like individuals, are making more calculated decisions to maximize productivity and reduce risk and unqualified expenses. A more cautious period for hedge funds is thus envisaged, with international clients rethinking large-scale refinancing and extending timeframes for existing projects. the presence of international banks, accounting firms and law firms. The Financial Services Commission developed flexible guidelines for the regulation of collective investment schemes, adopting industry best practice from various long-established and well-regarded jurisdictions. This has resulted in the incorporation of more than 439 investment funds and assets worth in excess of $43 billion. Mauritius remains committed to developing and maintaining conditions which are conducive to attracting international business and has hosted significant investments in India, China and Africa by global business companies. Many such companies (including fund management companies) were formed by large institutional players, attracted by Mauritius's established reputation as a centre of excellence and innovation, supported by responsible asset protection laws and robust anti-money-laundering laws. Mauritius benefits from its strategic location in the Indian Ocean between India and Africa and has double taxation agreements with several African countries. The Mauritius Stock Exchange is one of the most stable and effective in the African region. Over the years its operational, regulatory and technical framework has been overhauled to reflect changing standards in the global stock market environment. It is a part of the World Federation of Exchanges. The stock market was opened to foreign investors following the lifting of exchange control in 1994. Foreign investors need no approval to trade shares, unless investment is for the purpose of assuming legal or management control of a Mauritian company or acquiring more than 15% of a sugar company. Foreign investors benefit from numerous incentives (eg, revenue on sale of shares can be freely repatriated), and dividends and capital gains are tax free. The opportunity exists to develop new types of instrument and investment vehicle and to plan education and training in relation to the development of new services. For further information on this topic please contact Malcolm Moller at Appleby by telephone (+2 30 203 4300), fax (+2 30 210 8792) or email (mmoller@applebyglobal.com). According to separate amended Reg D filings with the U.S. Securities and Exchange Commission, two hedge funds managed by Bethesda-based Monsoon Capital have gathered $387.9 million total in pooled investment fund interests. Monsoon India Inflection Fund LP now has $163.1 million from 93 investors, while Monsoon India Inflection Fund 2 LP has $224.8 million from 167 investors. Principals named in the filings are MIIF General Partner LLC and its manager, Gautam Prakash, who is also founder and senior managing director of Monsoon Capital. Hedge fund investors could be left out of pocket as managers conjure up shortcuts to earn once again the lucrative bonuses based on performance fees that were a feature of the industry before the credit crisis. Despite 20 percent returns last year, big losses in 2008 mean that between a half and two-thirds of hedge funds are below high-water marks — performance levels they must hit before claiming a 20-percent fee on a fund's profits. This could persuade more managers to move to new firms where they can start earning these bumper fees straight away, forcing clients to decide whether the quality of the managers justifies the additional cost and disruption needed to follow them. “If certain funds don't reach their high-water marks, not the founders but the number 2s or numbers 3s in a hedge fund firm could start looking at other roles,” said one prime broker who declined to be named. Managers staying put might be tempted to take greater risks to hit high-water marks, or could close a fund to new investors, only to launch a new and similar fund where clients committing new money will pay fees on performance straight away. Like a mark on a riverbank showing how high past floods have reached, high-water marks are the top net asset value hit by a fund in its lifetime, and below these levels, a manager can't get performance fees even if the fund makes money. The intention is to stop managers taking fees, beyond standard management charges, simply for making back money lost in previous years. Firms such as Man Group, Brevan Howard and GLG have launched versions of their hedge funds as Ucits III funds, a more regulated structure that allows them to be sold across Europe, hence opening up the strategy to a wider pool of investors. Such funds can often earn performance fees straight away, even if the funds they mirror are still 'under water'. “One attraction of launching a new fund is that managers can immediately begin to earn performance fees on the new vehicle,” said Kate Hollis, lead analyst at S&P Fund Services. With the average fund down 2.7 percent over the past two years, frustration is growing as managers find themselves some way off earning the fees to which they have become accustomed. “It will create some changes — new openings or some (funds) closing,” said Patrick Fenal, chief executive of Unigestion, which runs $3.1 billion in funds of hedge funds. Moreover, managers who are above their high water marks may be unhappy sharing their bonuses with less successful managers and could leave for a rival. “The incentive for someone who's performed very, very well to stay in a shop where de facto bonuses will be less than elsewhere (is less). They could create their own fund or go and work for someone else,” said Unigestion's Fenal. GLG star Greg Coffey's departure in 2008 was linked by some commentators to the firm's funds being below high-water marks. A source close to Coffey said on Tuesday: “This is nonsense and it never had anything to do with high-water marks”. Data from Hedge Fund Research shows just 31 percent of hedge funds hit high-water marks during the fourth quarter last year, and barely half hit it during the whole of 2009. Regulators' concerns lie elsewhere, and fears have been raised that managers some way off high-water marks may be encouraged to take riskier bets with investors' money. “There may be incentives to take greater risk,” Britain's Financial Services Authority said in a survey of 50 firms, released last week, which showed about half of hedge funds' main share classes were below their high-water mark. Unigestion's Fenal said checks on such funds were vital. “Most good managers are above historical high-water marks. All the ones below are more questionable. You have to question in your due diligence your motivation to keep them, to be sure they won't have (risky) behavioural patterns to reach the desired level (to earn fees),” he said. However, some doubt whether moves such as setting up new funds will really get past investors' watchful eyes. Standard & Poor's, the world's leading index provider, announced today that it has licensed the National Stock Exchange of India (NSE), the largest stock exchange in India, to create and list Indian Rupee-denominated futures contracts on the S&P 500 (subject to regulatory approvals). The licensing agreement, jointly from S&P and S&P-licensee Chicago Mercantile Exchange to NSE, is part of a landmark cross-listing arrangement announced today by CME Group, the world's leading and most diverse derivatives marketplace, and NSE that covers benchmark indices for U.S. and Indian equities. The Rupee-denominated S&P 500 futures contracts will be made available on NSE via a sublicense from Standard & Poor's. Widely considered the single best gauge of the U.S. equity market since it launch in 1957, the S&P 500 is the world's most followed stock market index with nearly $1 trillion directly indexed and $3.51 trillion benchmarked to it. “Today's agreement with NSE is a significant milestone in the integration of Indian capital markets with global markets. It represents the first time that Indian investors will be able to directly trade the U.S. equity markets as defined by the S&P 500. It also underscores Standard & Poor's commitment to providing index solutions to all of Asia Pacific, since this is the first time that the S&P 500 will trade as a derivative on a non-US exchange,” adds Roopa Kudva, Region Head, South Asia, Standard & Poor's. Standard & Poor's, a subsidiary of The McGraw-Hill Companies (NYSE: MHP), is the world's foremost provider of independent credit ratings, indices, risk evaluation, investment research and data. With offices in 23 countries and markets, Standard & Poor's is an essential part of the world's financial infrastructure and has played a leading role for 150 years in providing investors with the independent benchmarks they need to feel more confident about their investment and financial decisions. For more information, visit http://www.standardandpoors.com.